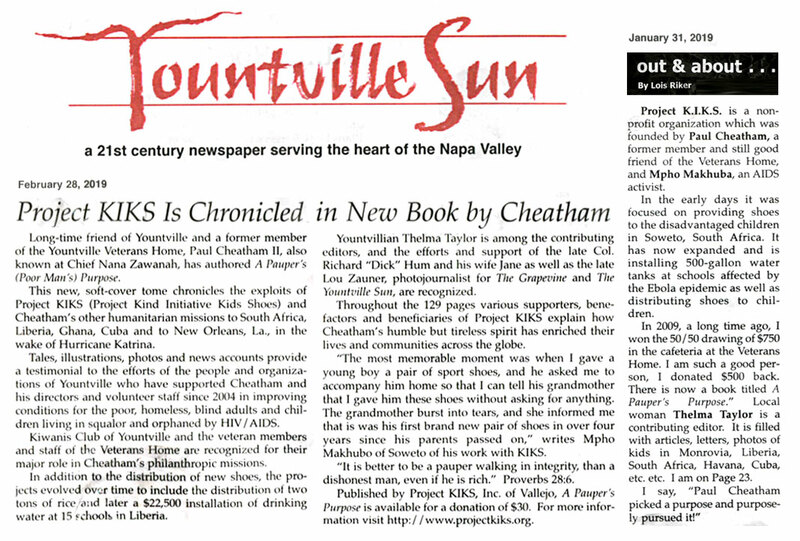 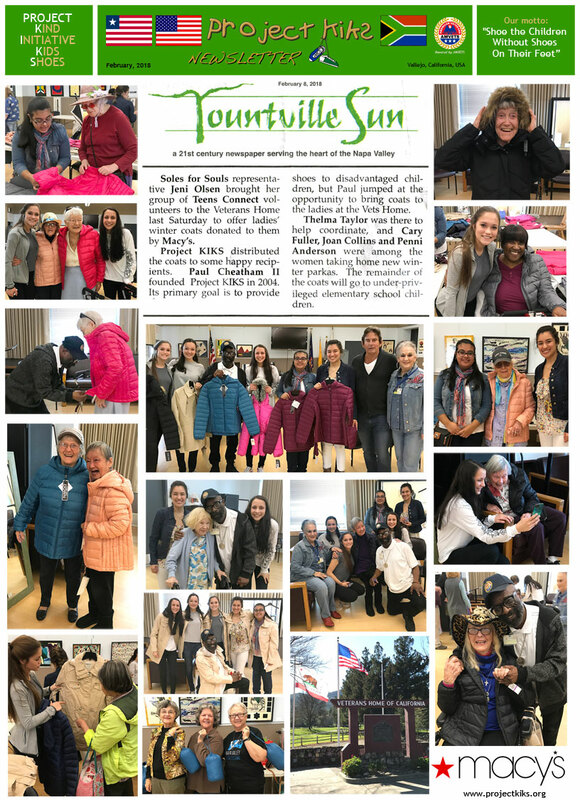 You can order a copy of "A Pauper's (Poor Man's) Purpose"
to Project KIKS, requesting "Book"
Click here to view a larger image of these articles. 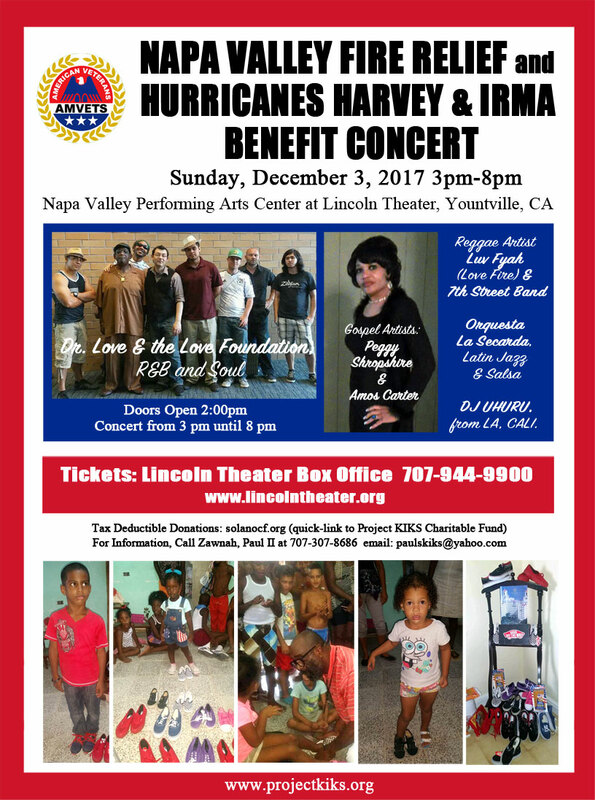 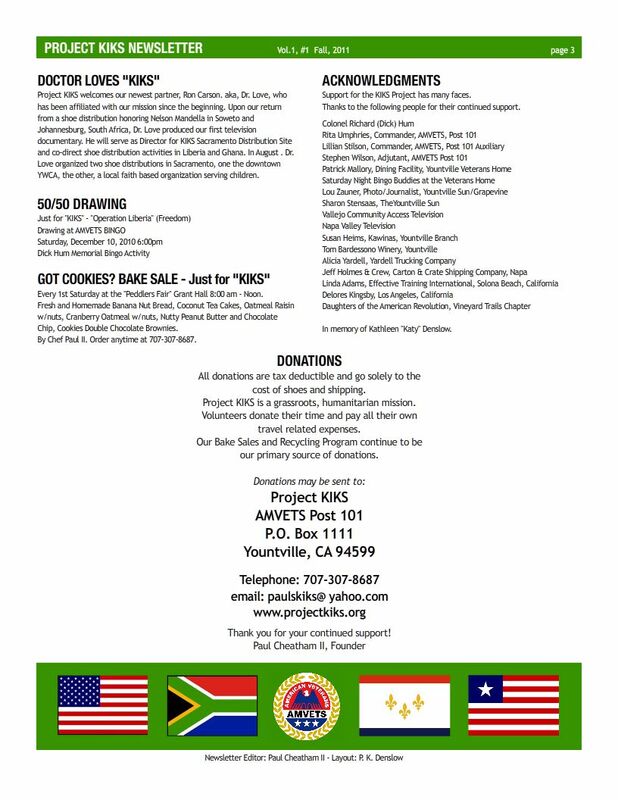 Click here to view/download this flyer in High Resolution for Printing. 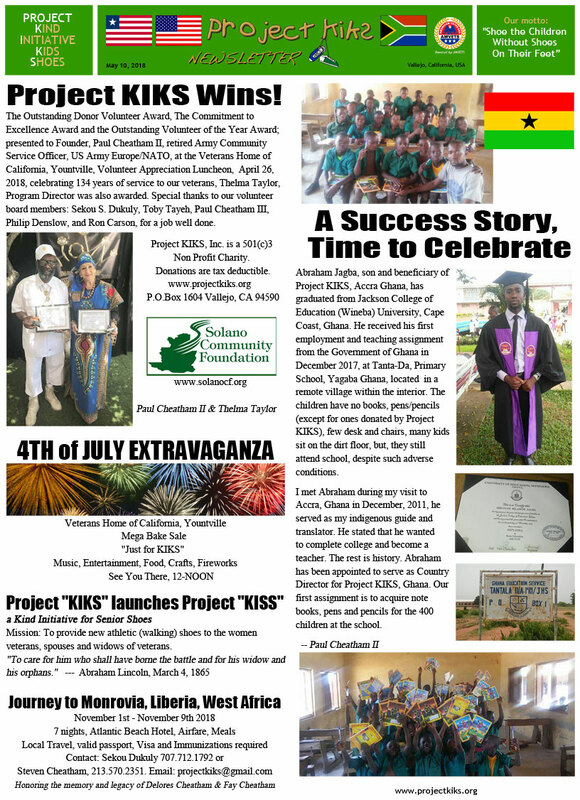 Click here to view/download this newsletter in High Resolution for Printing. 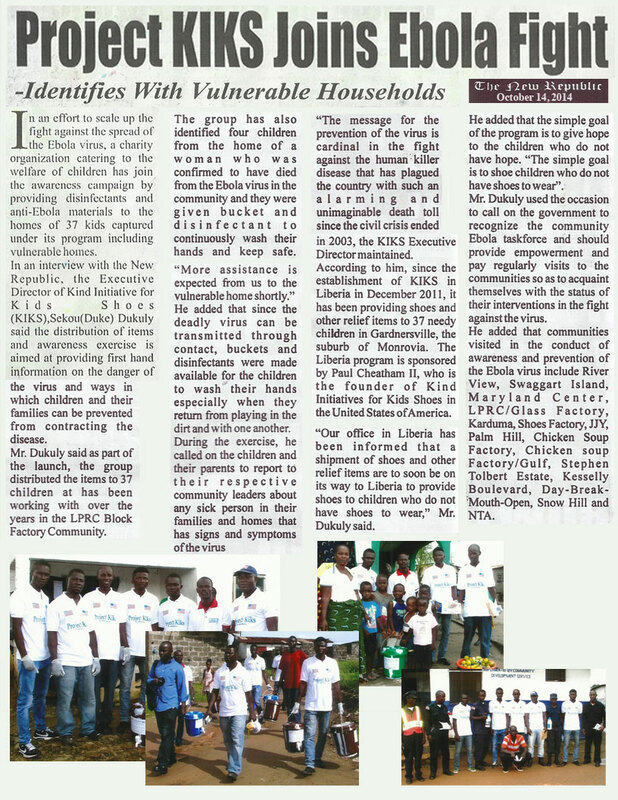 Click here to view/download this article in High Resolution for Printing. 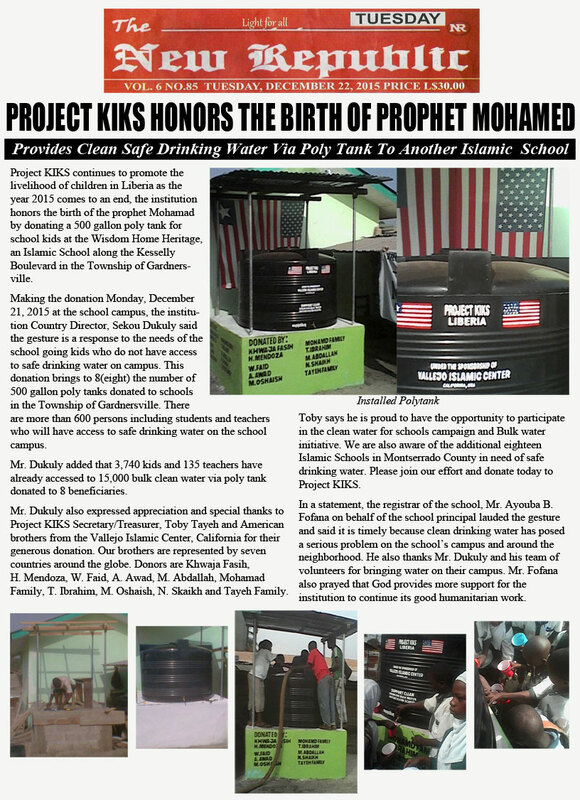 Click here to view/download this program in High Resolution for Printing. 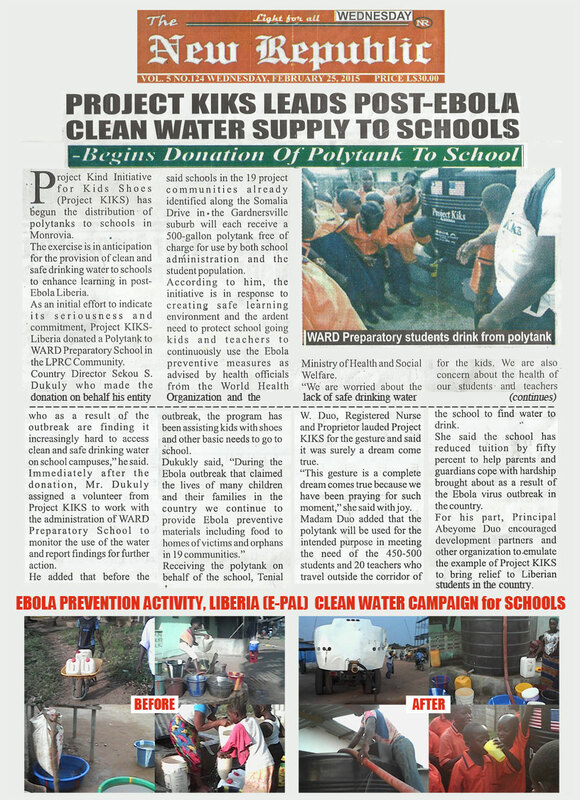 In accordance with Minister of Education Wash In Schools (WINS) Directive, August 2015. 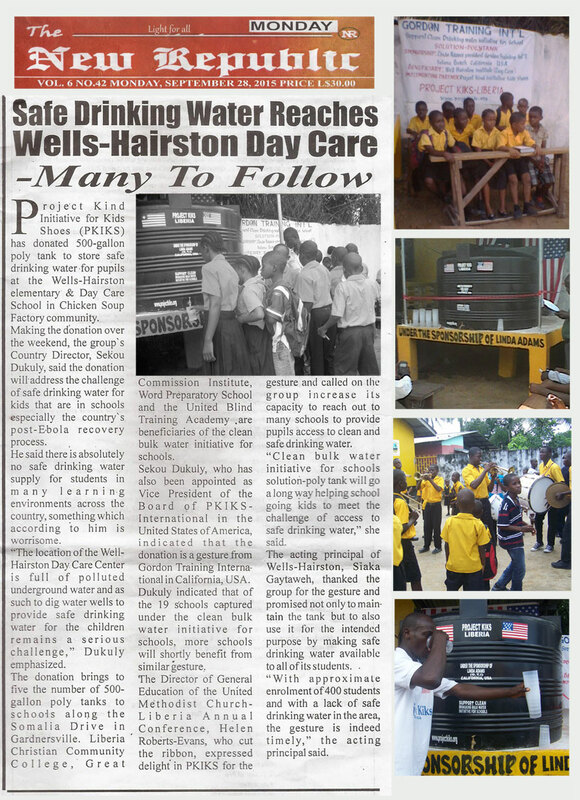 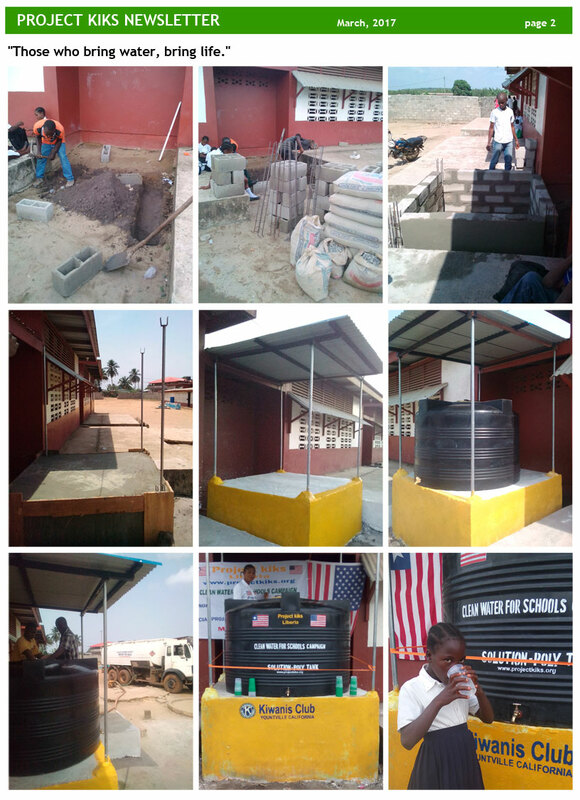 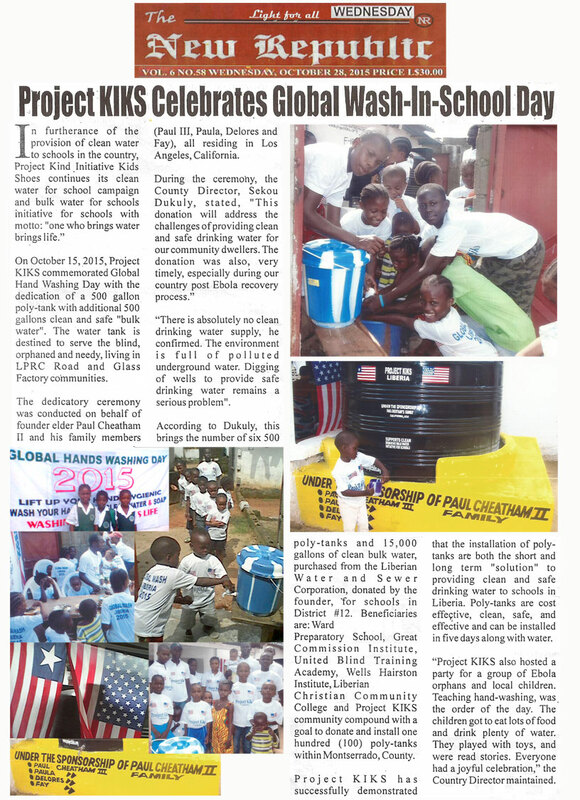 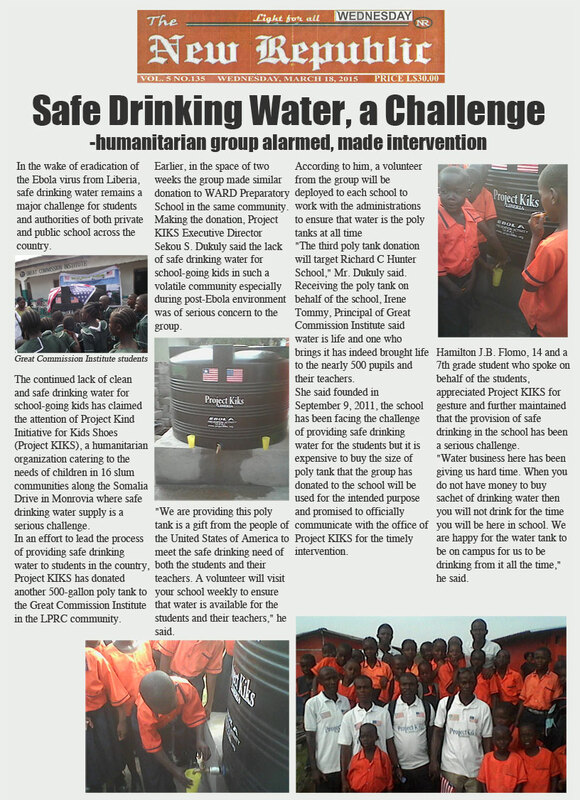 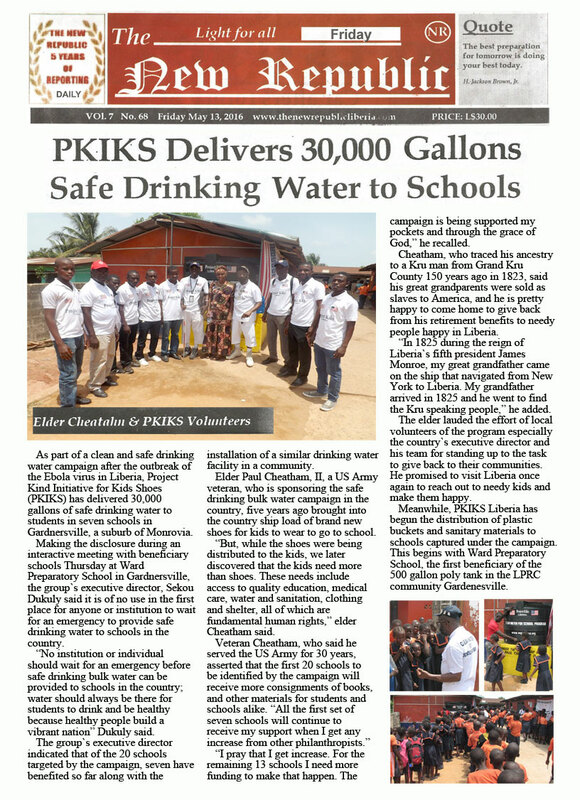 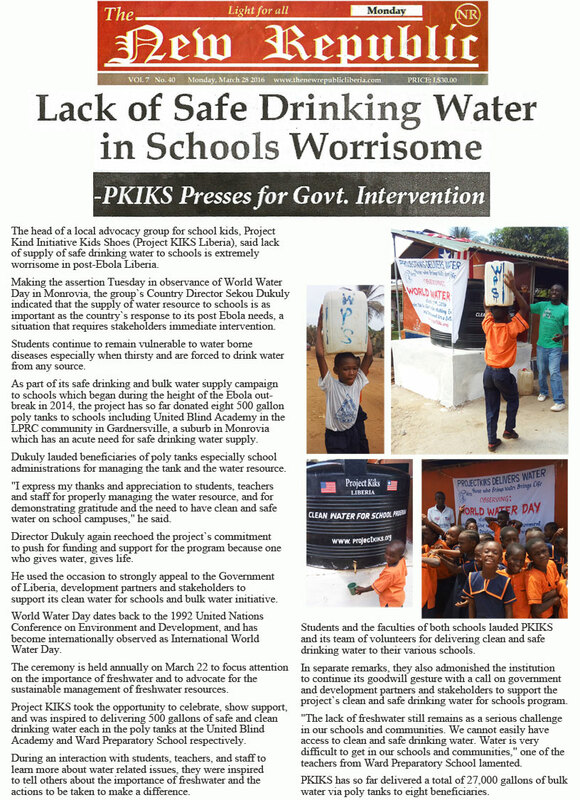 Project KIKS has successfully demonstrated that: Poly Tanks are the short term and long term "solution" to providing clean "bulk water" to schools in Liberia. 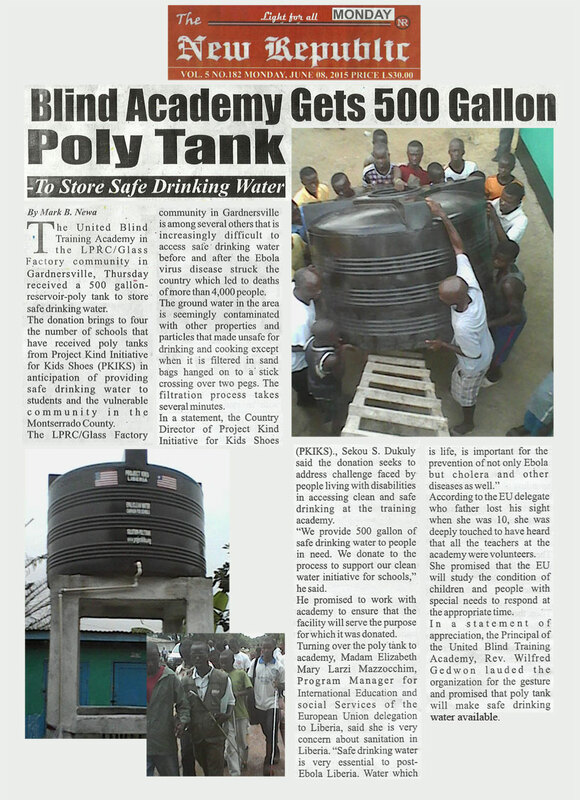 Poly Tanks are safe, efficient cost effective. 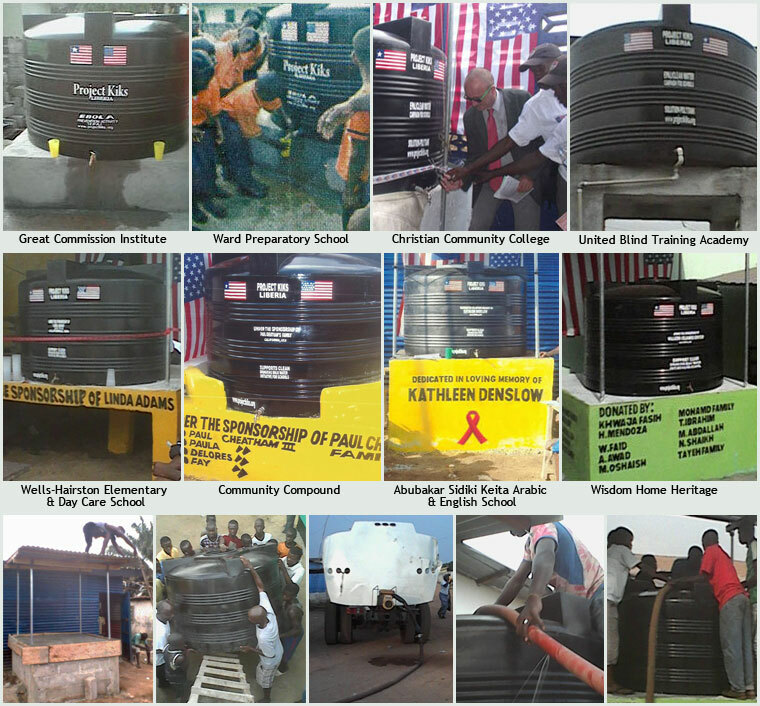 Tanks can be installed within five working days and filled with water. 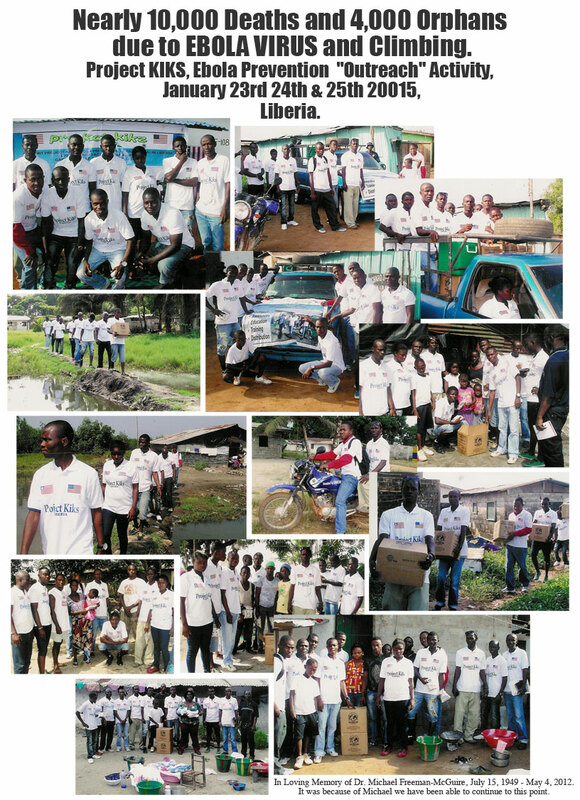 Due the Ebola Virus in Liberia, we are going to postphone our 10th Anniversary Celebration in South Africa. 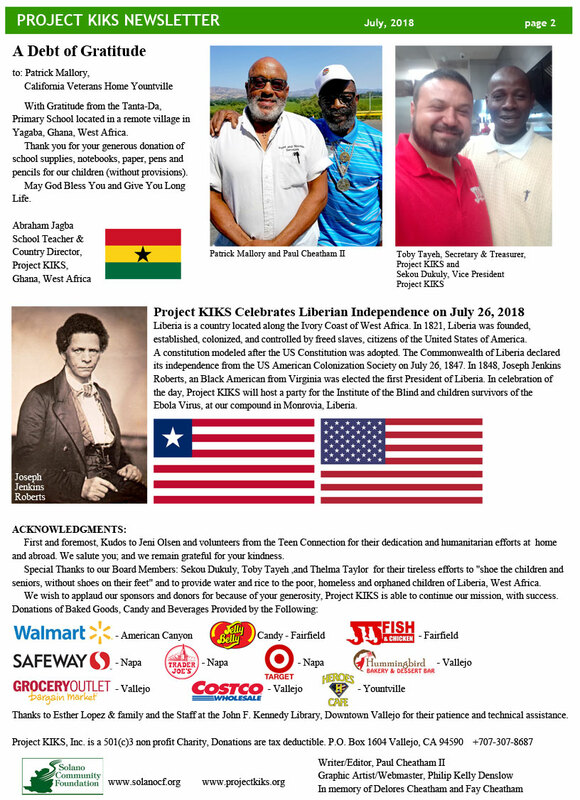 Our Special guest Sekou Dukuly from Liberia will be unable to attend. 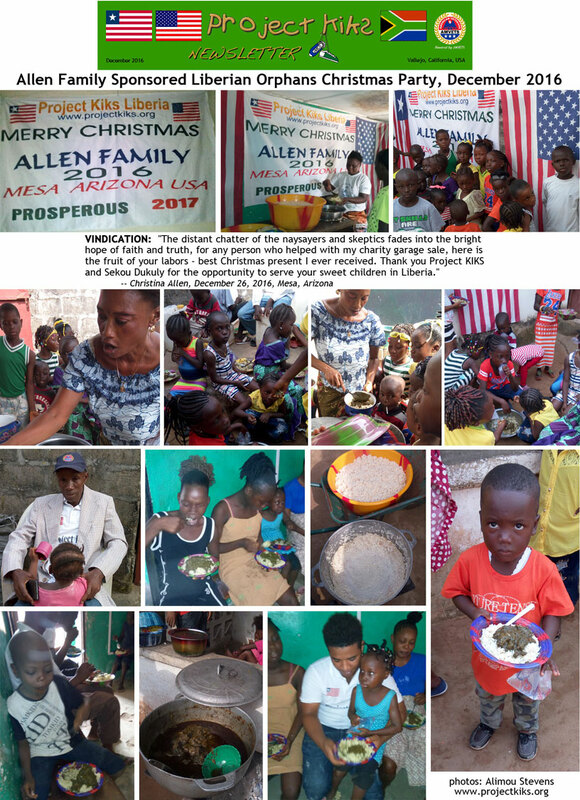 Funds for the trip will be used to support our Ebola Prevention Activity and Christmas Party for our children orphaned by the Ebola Virus. 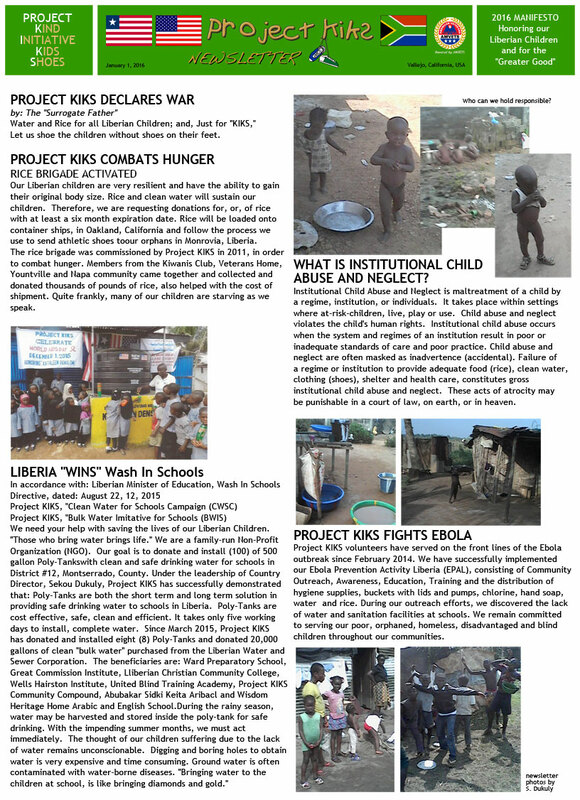 Click here to view/download this New Republic article and Photos in High Resolution for Printing. 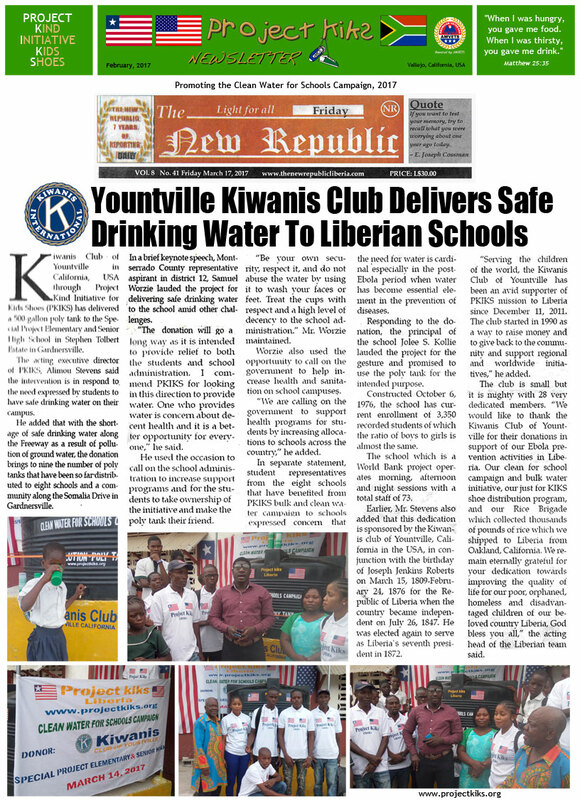 Click here to view/download the New Republic article in High Resolution for Printing. 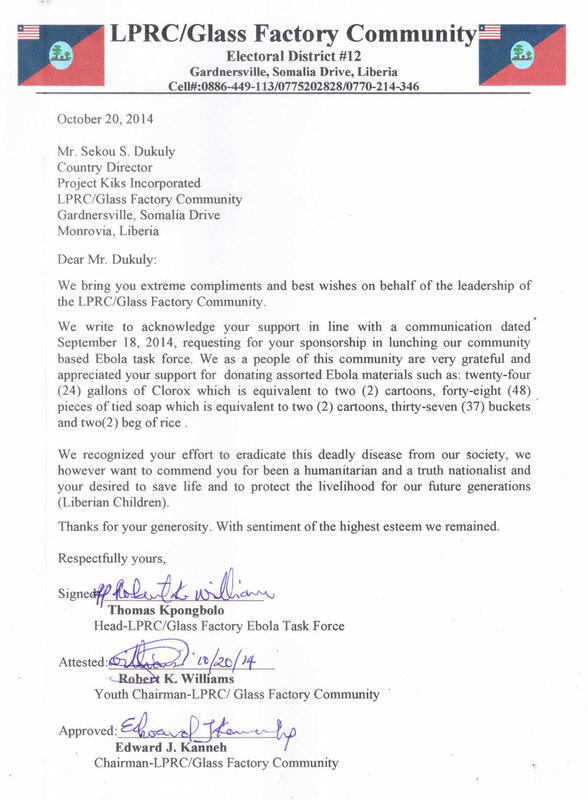 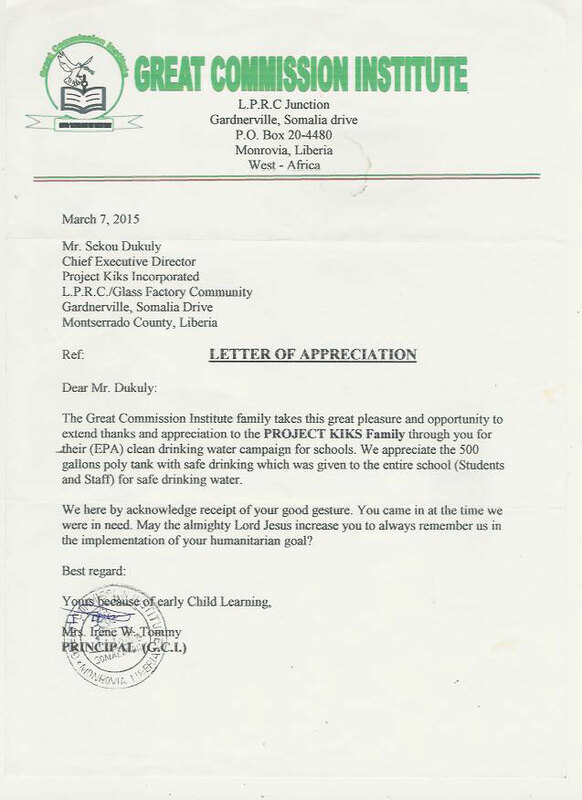 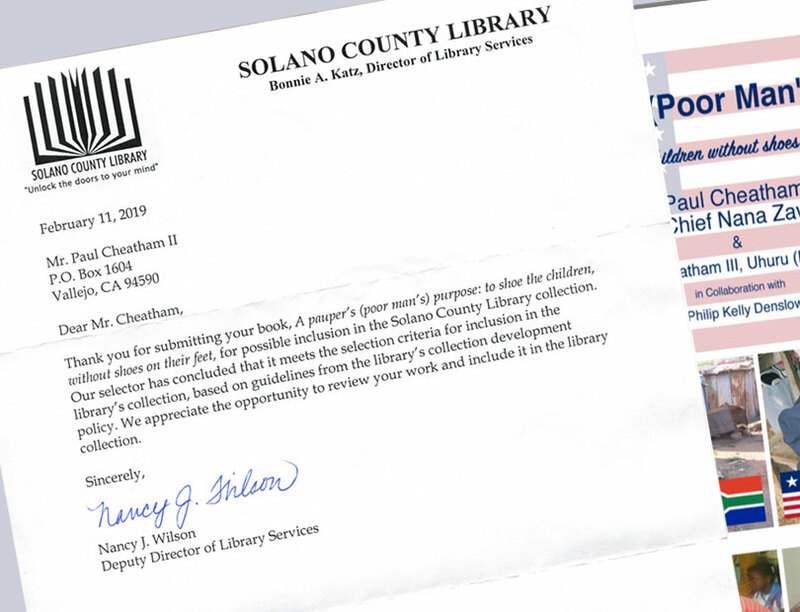 Click here to view/download the LPRC Glass Factory Letter in High Resolution for Printing. 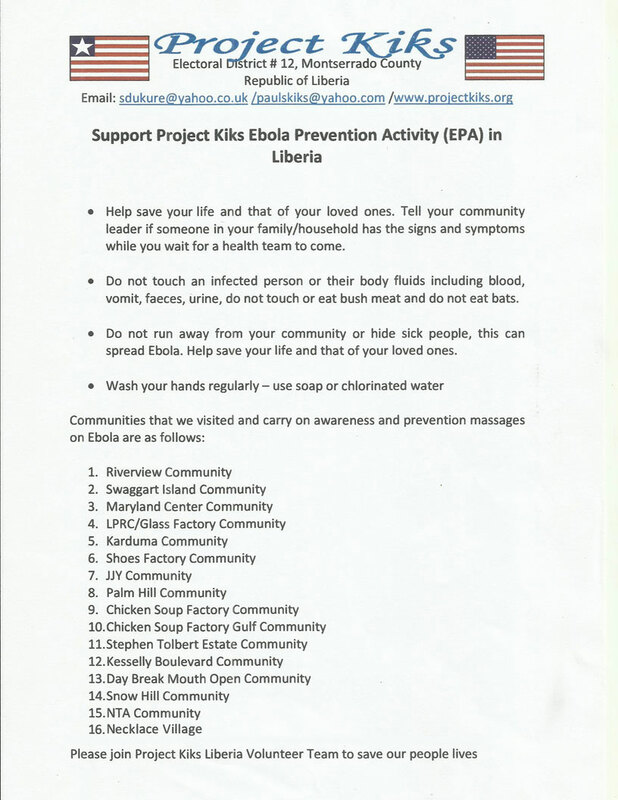 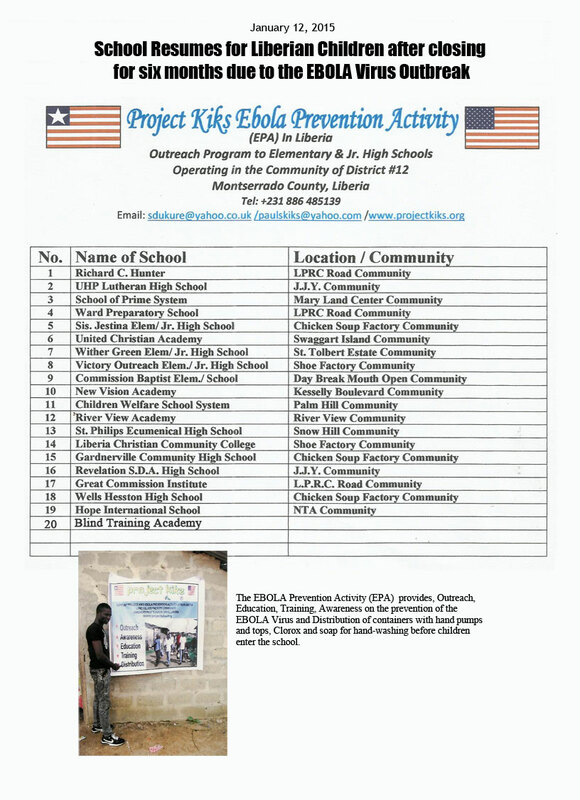 This flyer devedoped by Sekou (Duke) Dukluy, Project Director, Ebola Prevention Activity (EPA) Liberia. 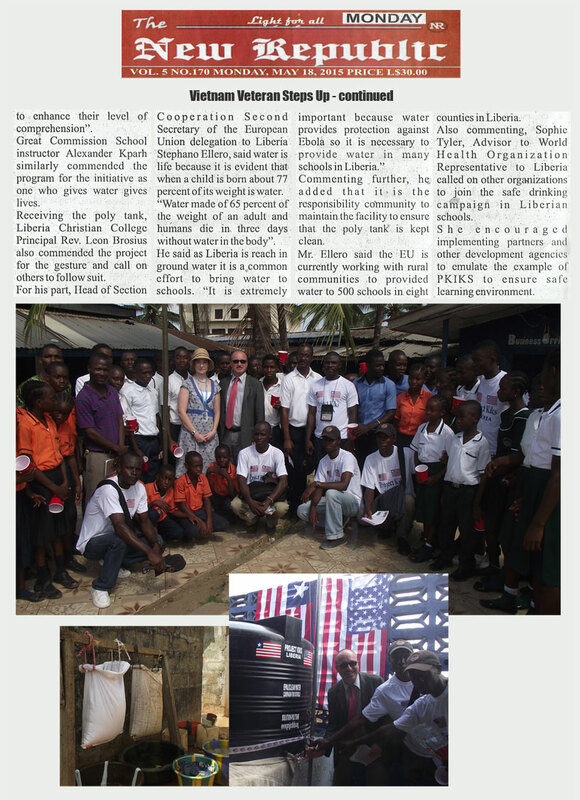 Click here to view/download the #2 Liberian EPA Newsletter in High Resolution for Printing. 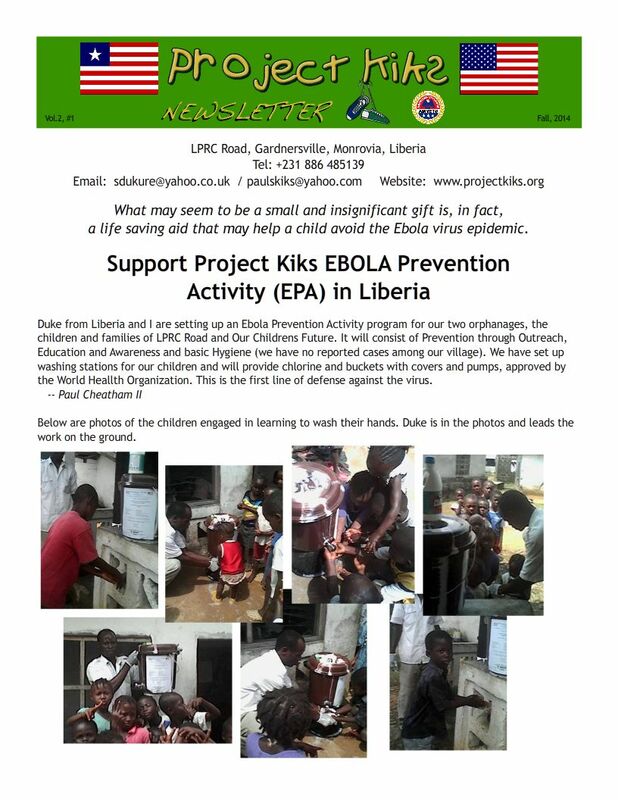 Click here to view/download the Liberian EPA Newsletter in High Resolution for Printing. 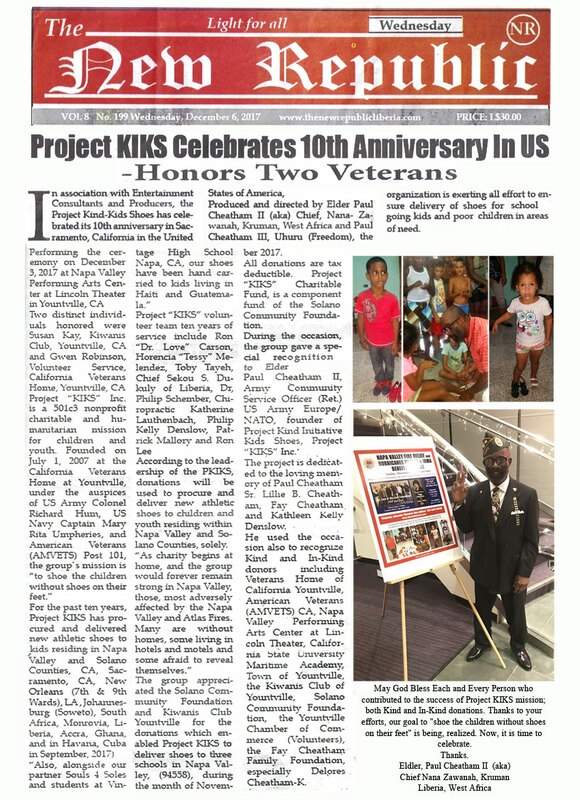 Project KIKS will celebrate our 10 Year Anniversary in Honor of our Father Nelson Mandela. 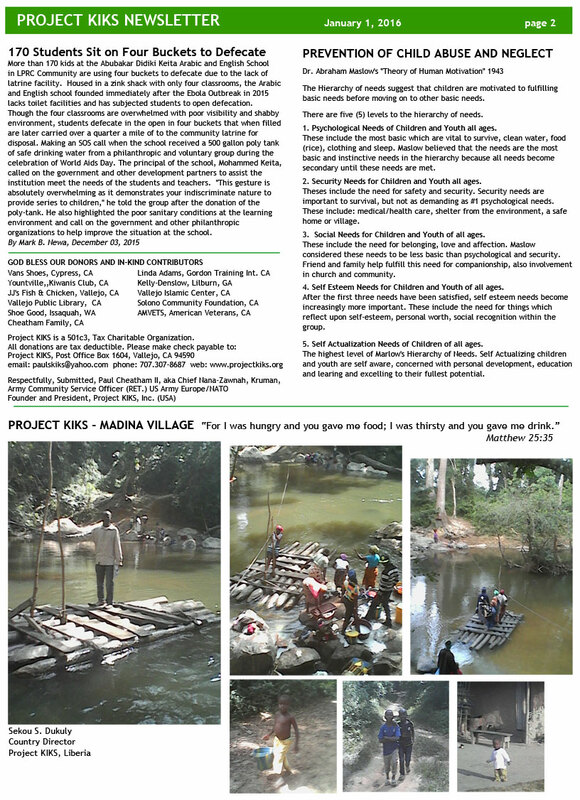 Plans are being finilized for a 6 day journey to South Africa, God Willing, in December 2014. 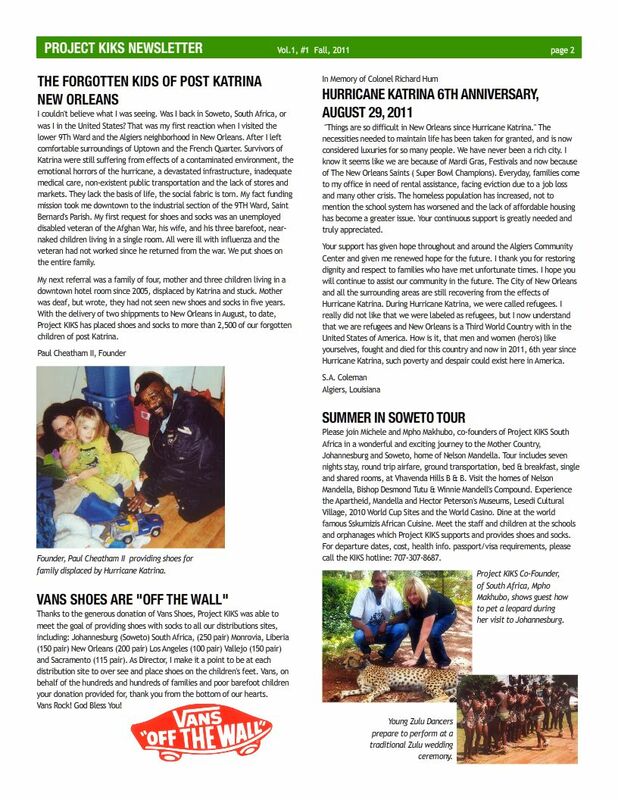 Our visit will begin in Johannesburg/Soweto where we tour the home of Father Nelson Mandela, the Mandela, & Apartheid Museums. 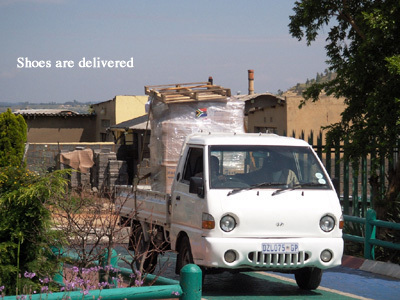 Of course we will feast at Sakumzi's African Cuisine, located with walking distance from our Vhavenda Hills B&B. 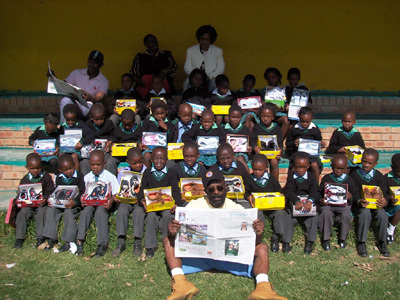 We look forward to seeing our friends at the Soweto Gospel Chior. 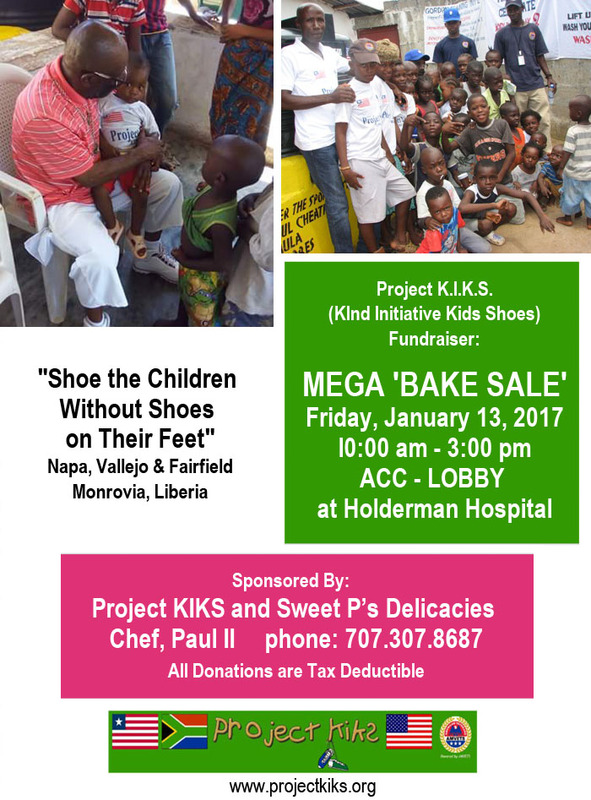 We are bringing shoes, socks, & candy for a party we are going to throw for the kids at our charity, Nkosis Haven, a home for kids & women with HIV/AIDS. 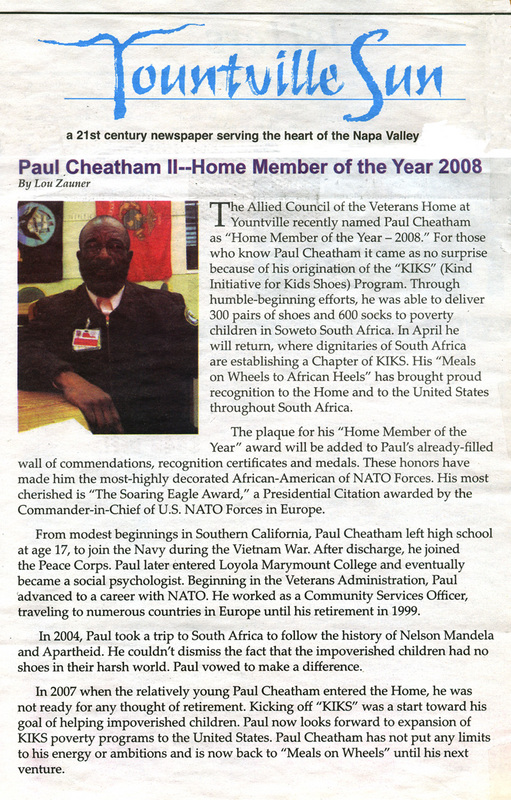 From Soweto, God Willing, we will travel to the birthplace and ancestryal homeland of Father Mandela; a small village named Qunu, located in the East Cape. 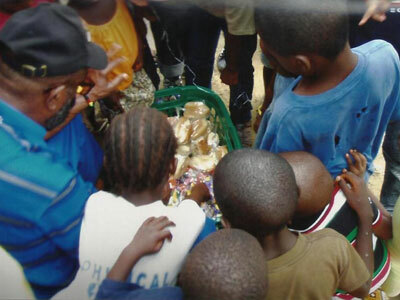 There we will pay our tribute at the gravesite of Father Mandela. 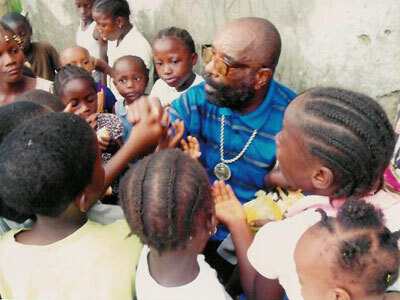 Our next stop will be at Cape Town where will tour Robin Island where our Father spent 25 years in prison. 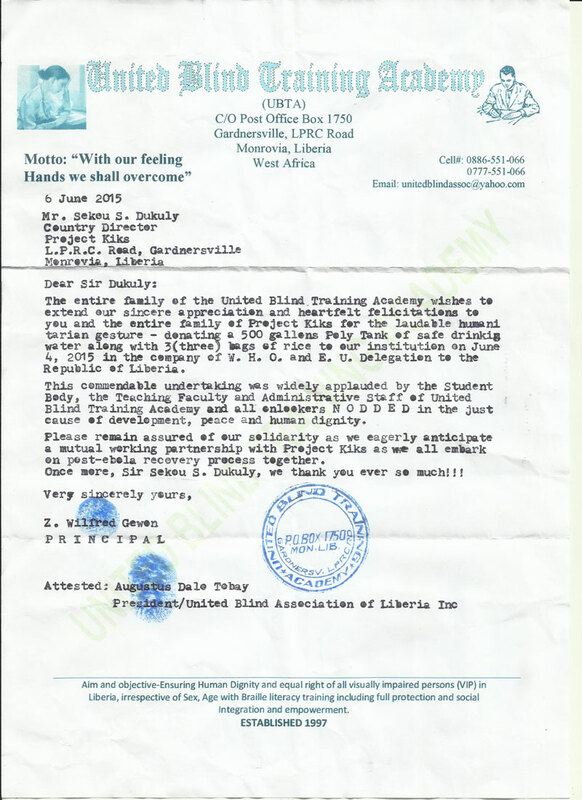 Yes, we will be able to spend some time at the beach. 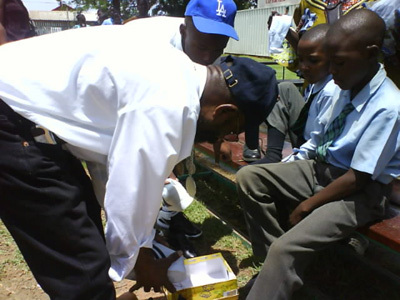 From there we will return to Johanesburg enroute to the US. 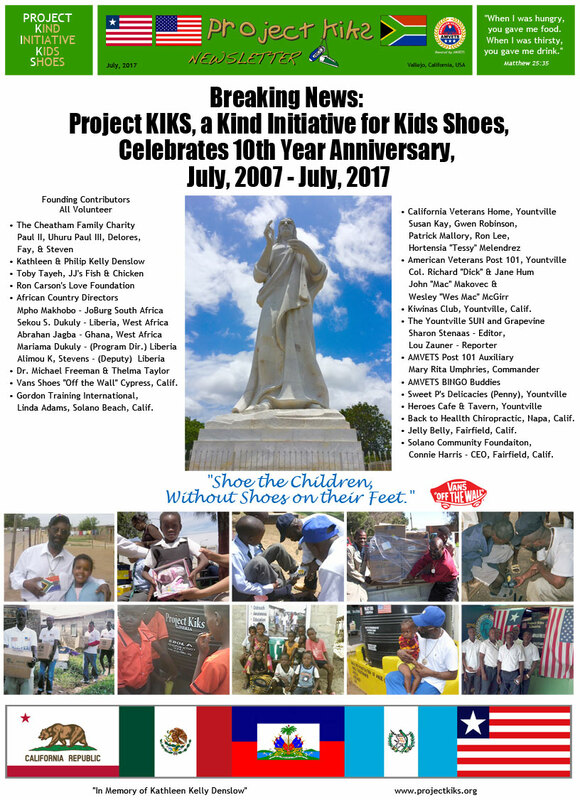 Project KIKS was founded in 2004, in Soweto/Johannesburg by Paul Cheatham, Los Angeles, California USA and Mpho Makhubo. 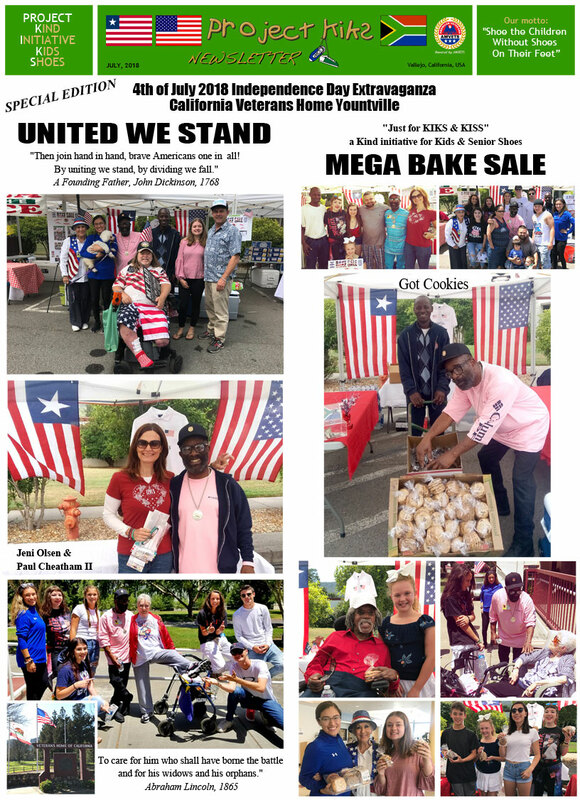 Co-Founders are Uhuru, Paul Cheatham II and Michele Mahubo. 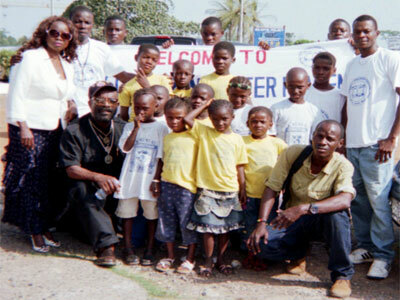 Our specilal invited guest is Sekou "Duke" Dukuly. 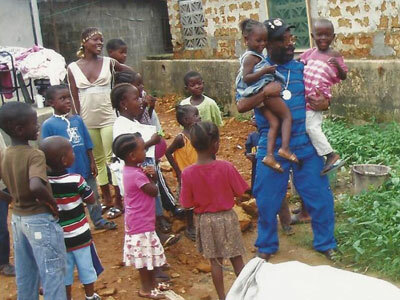 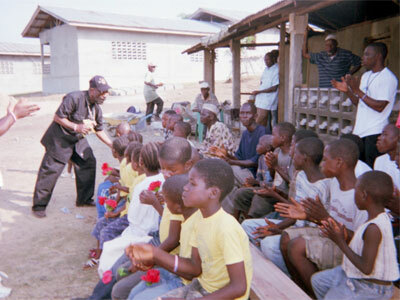 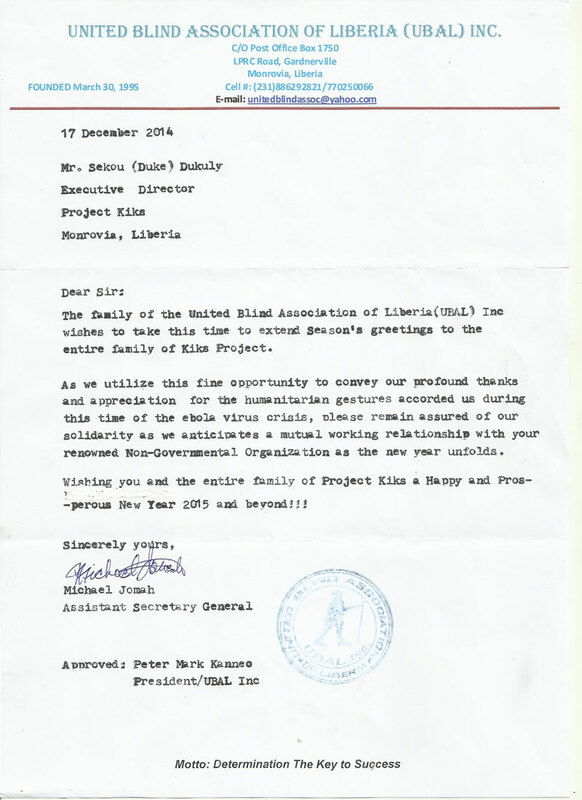 Duke serves as our Director of Operations for Project KIKS Liberia, established in December 2011. 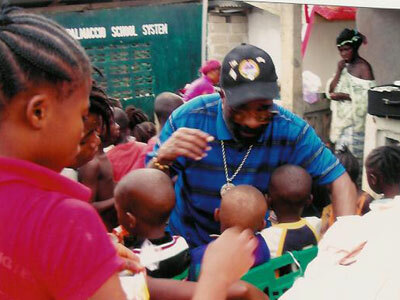 Duke has been with me from the beginning. 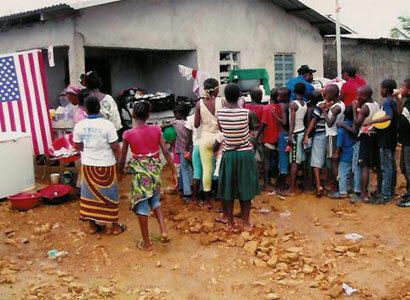 We have been in riots and have starved while serving the children in the bush. 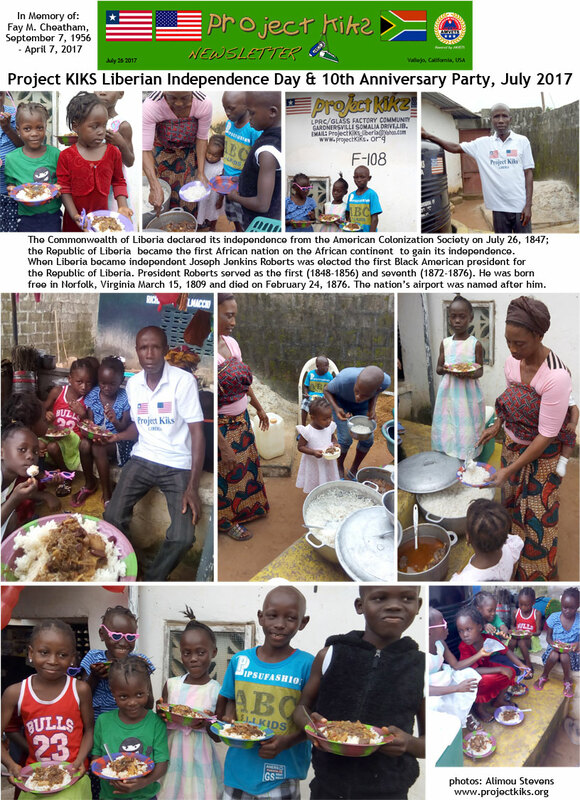 He has protected me with life and has served the mission well. 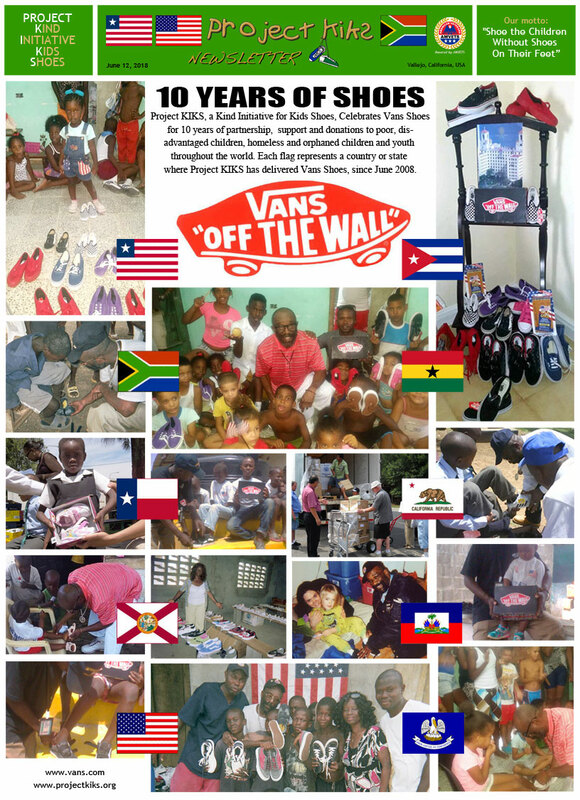 Much Love & Respect. 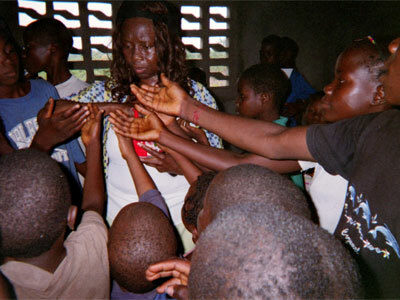 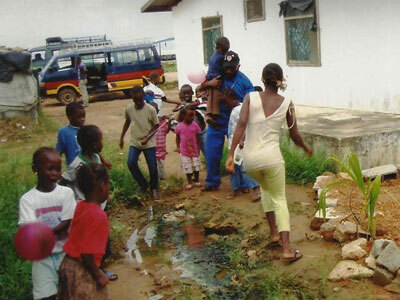 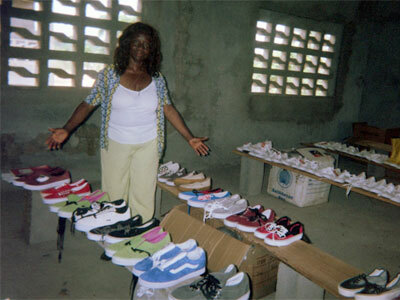 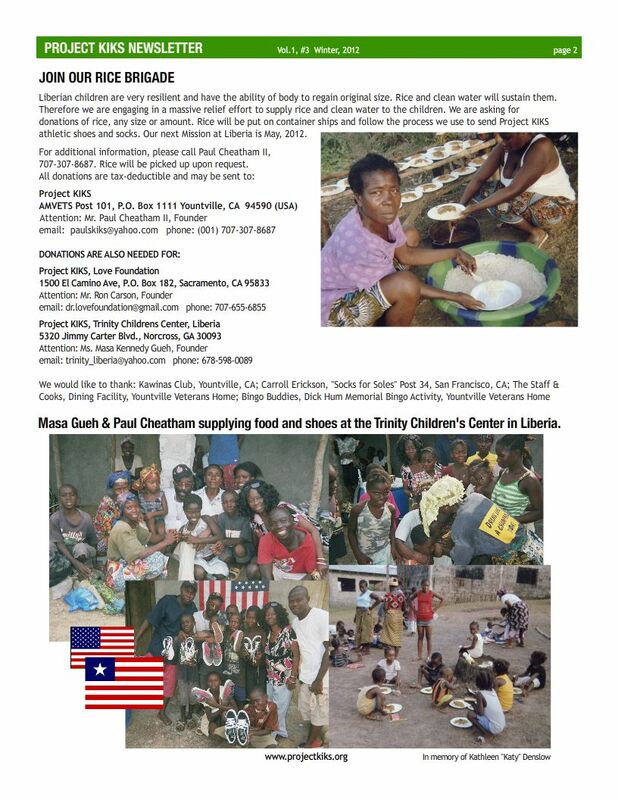 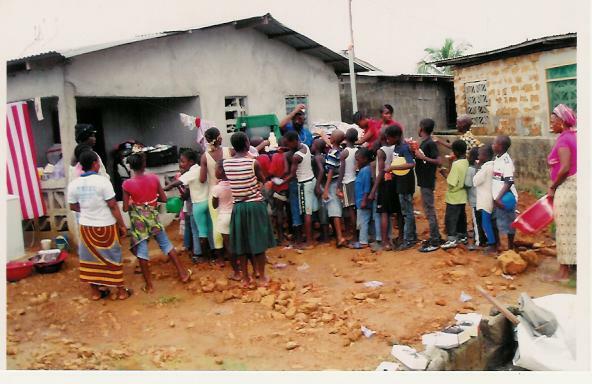 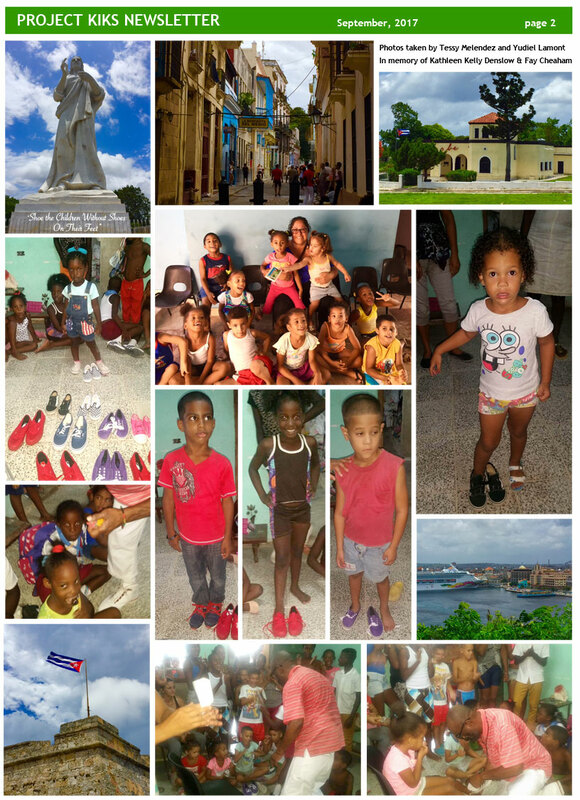 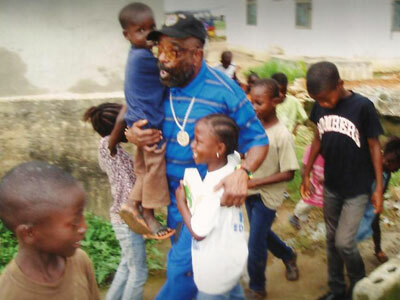 In February 2013, Paul and Masa distributed Shoes and Food at the Trinity Children's Center in Liberia. 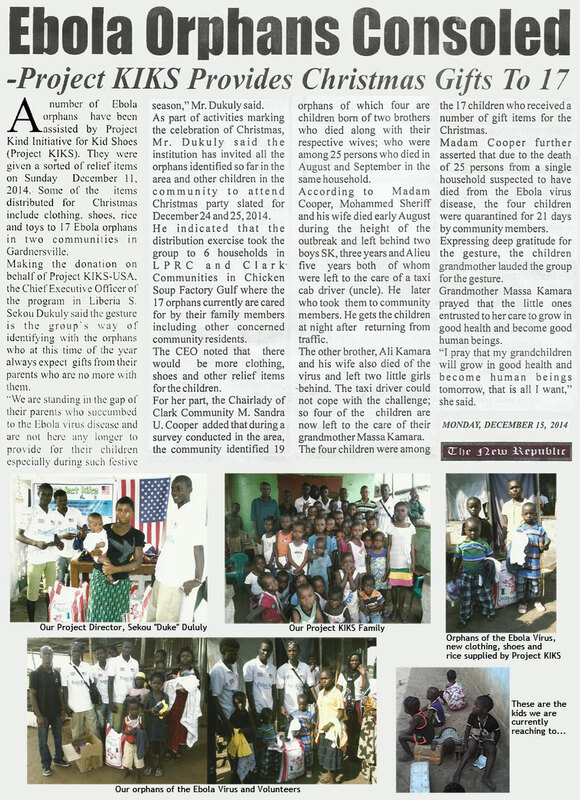 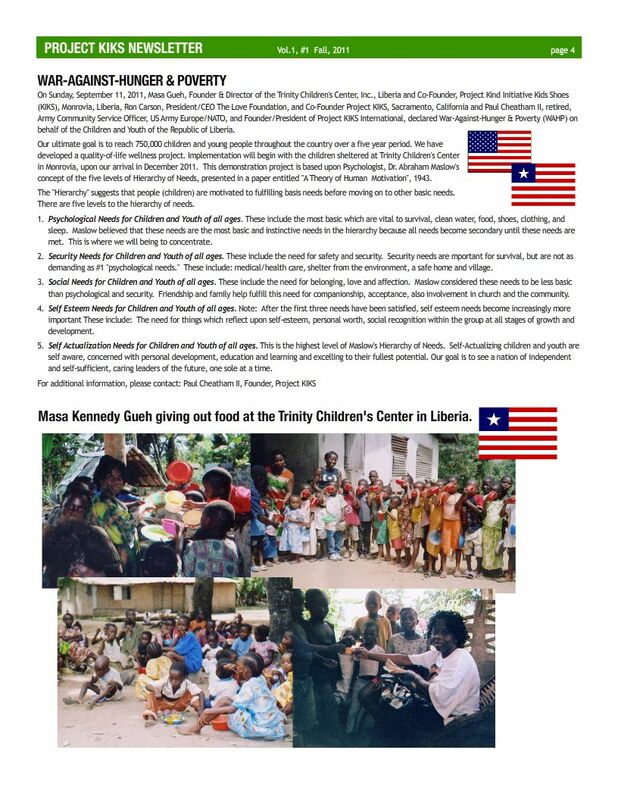 Click here to view/download the Second Liberian Newsletter in High Resolution for Printing. 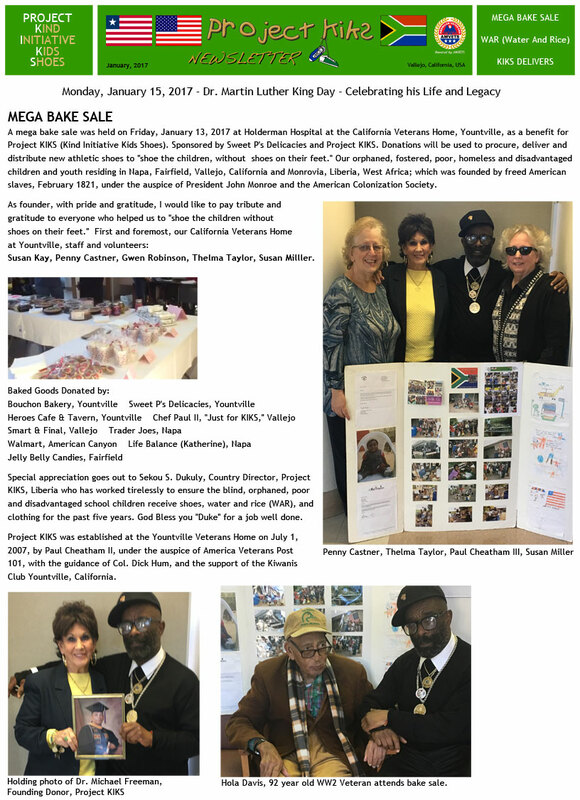 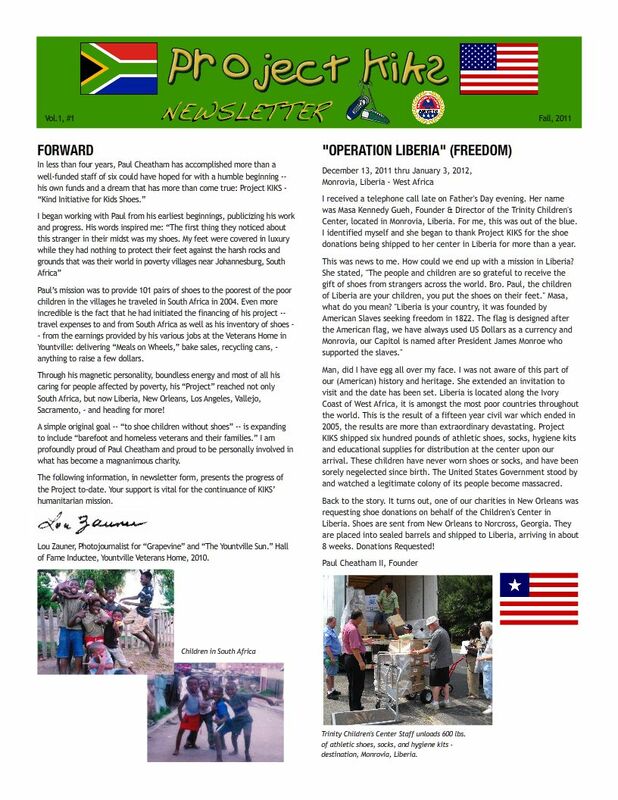 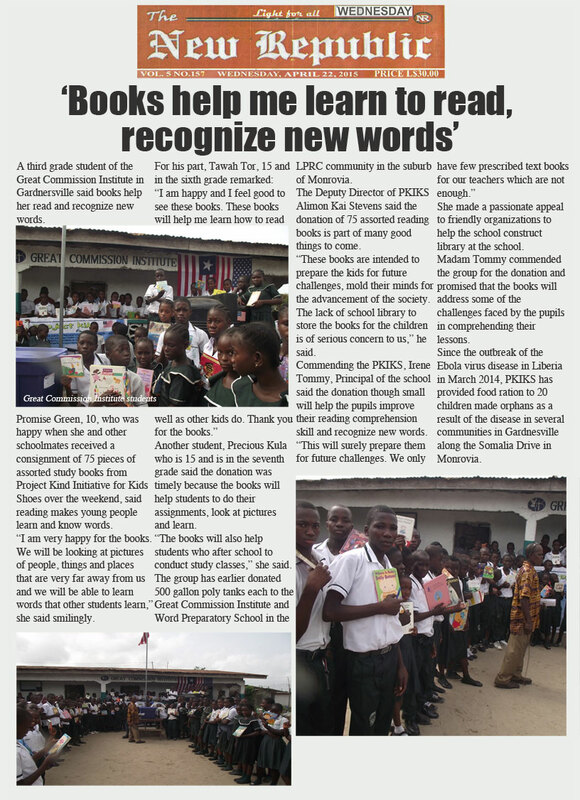 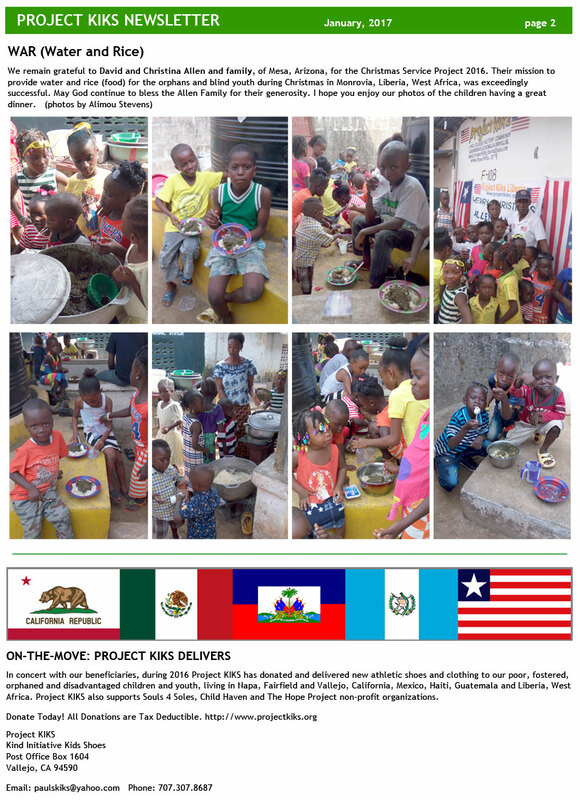 Below is the Second Liberian Newsletter for web viewing. 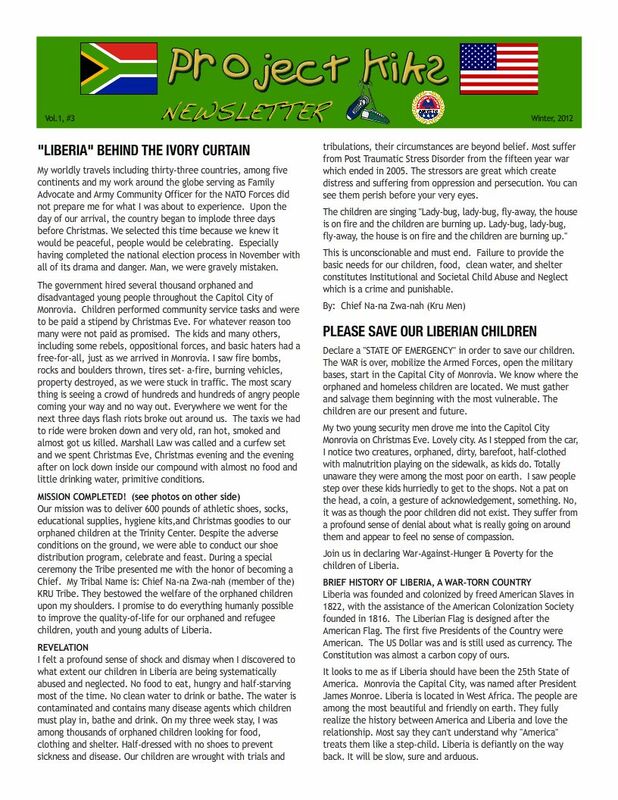 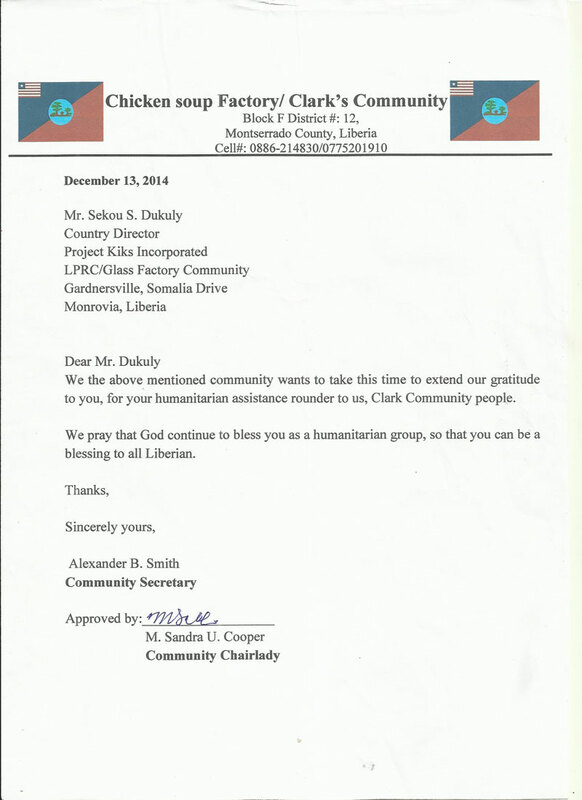 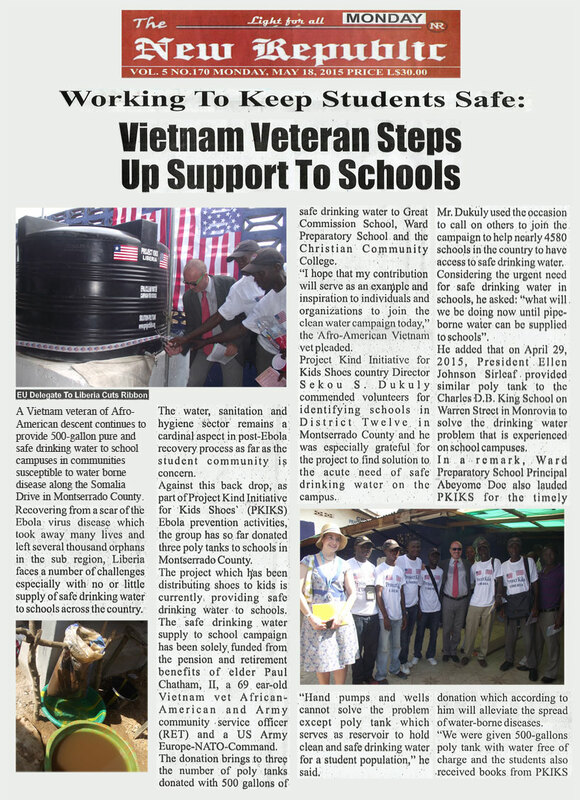 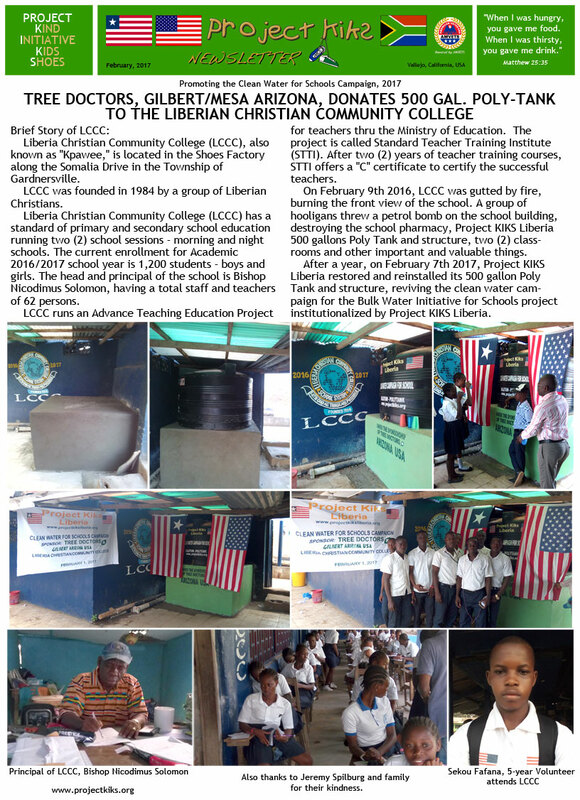 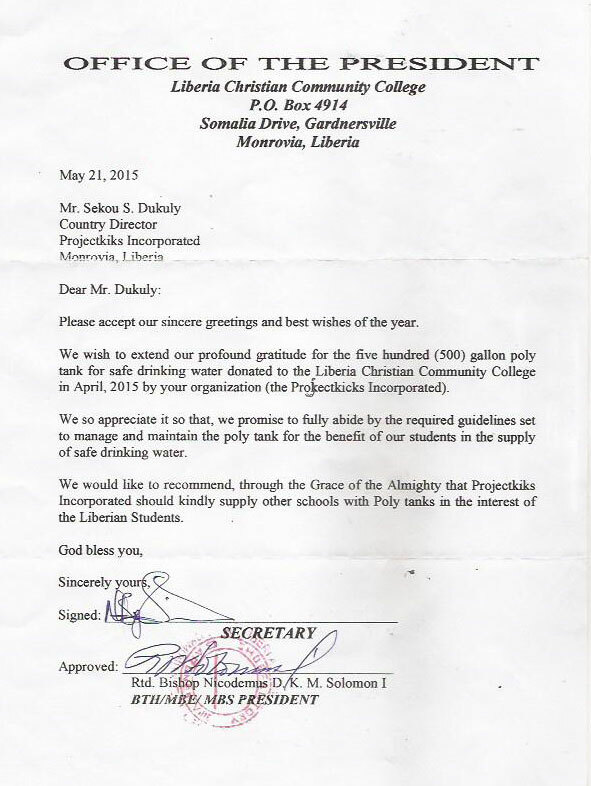 Click here to read the First 2-page Liberian Newsletter. 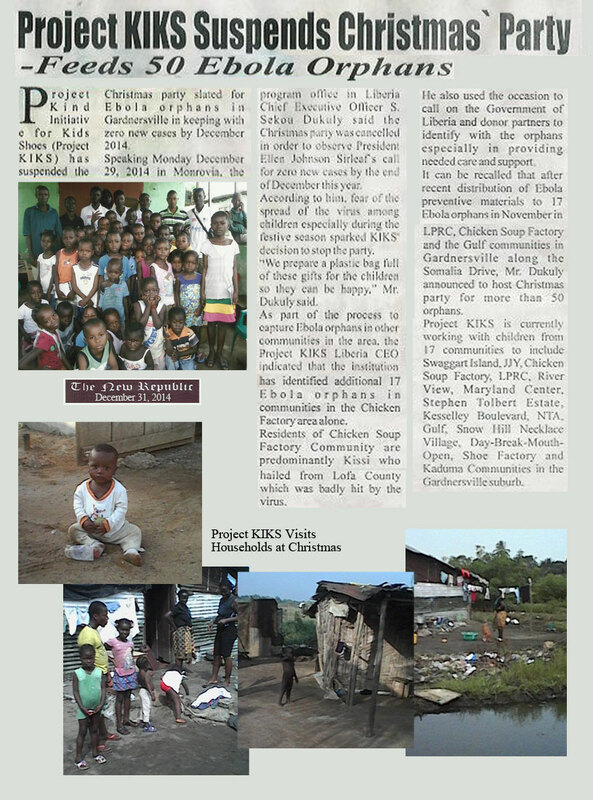 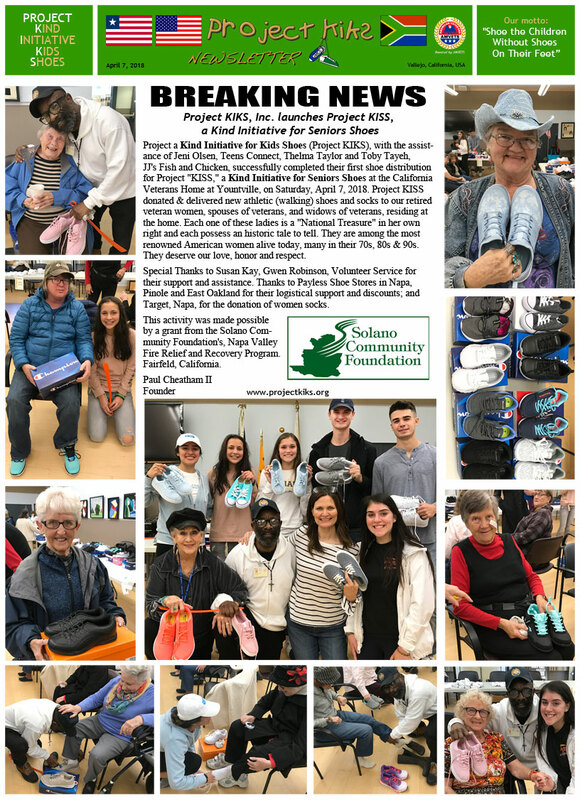 Below is the first issue of the Project KIKS Newsletter. 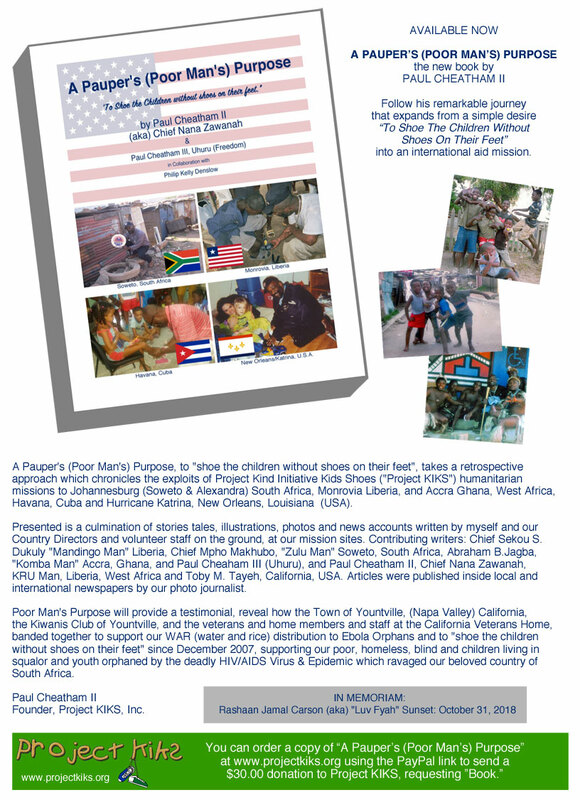 CLICK HERE to view/download a hi-rez pdf file version, suitable for printing and mailing. 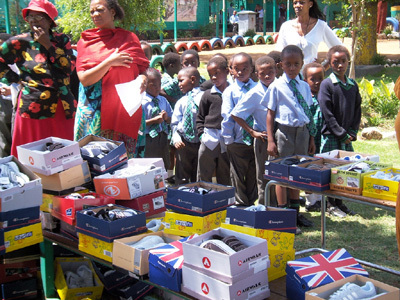 Project KIKS was formed in 2004 to provide shoes to disadvantaged children in and around Soweto, South Africa.